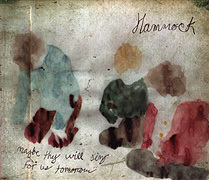 The most challenging part of Maybe They Will Sing For Us Tomorrow (61'10") by Hammock is staying awake until it ends. 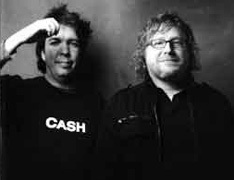 On their fifth release the duo of Mark Byrd and Andrew Thompson offer 11 pillow-soft tracks. From ambient lullabies to panoramic anthems this album rings with music from out of the American Elsewhere. Layers of reverberating guitar fill the cavernous soundfield, the pluck of the strings truncated to round off any edge. Digital processing extends the range of their instruments and lends the music a symphonic character. The occasional appearance of a string section and cello adds to this mystique. Vast, delicate and majestic, Maybe They Will Sing For Us Tomorrow fits in well alongside Lanterna, Jeff Pearce and Robin Guthrie, as well as the instrumental works of Sigur Ros. This kind of music deepens us, extending our feelings through its poetic vision.